Victory for the Dart Divas! It was the inaugural Buckfastleigh Ice Gala. 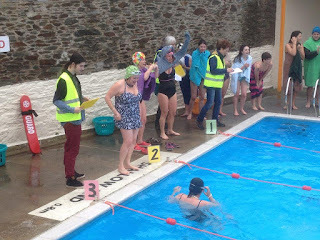 Swimmers from all over Devon and as far away as London descended on the town's lovely pool for various races, fancy dress fun and jacket potatoes. Far from being icy, the water was relatively warm at 8.6 degrees. 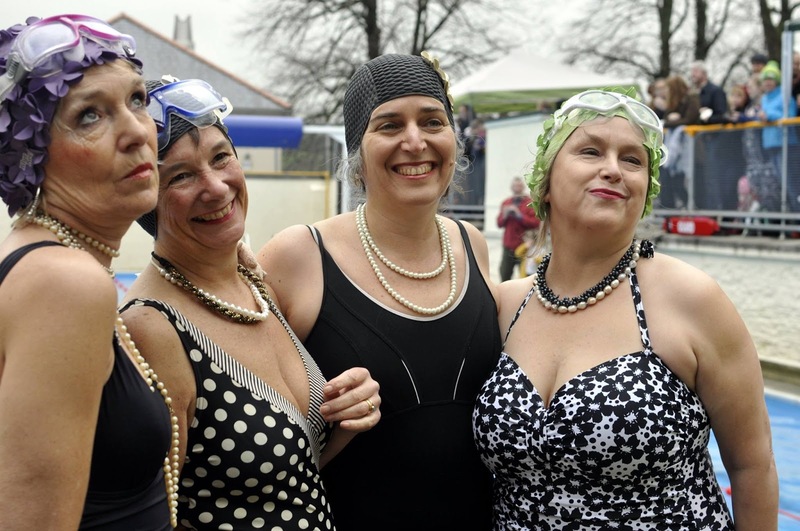 Rachel, Yaara, Judy and I entered for a laugh, calling ourselves the Dart Divas, on account of our regular weekly swim at Spitchwick. We decided to go for the glam look, attiring ourselves in black and white swimsuits, strings of pearls and a lot of lippy (Rachel went the extra mile, accessorising her outfit with a feather boa and a long cigarette holder). To our utter amazement we won our relay race, thrashing not only the Heavitree Swimmers, NAC Borneo 3 (whoever they were), but the much feared Stoke Screamers. 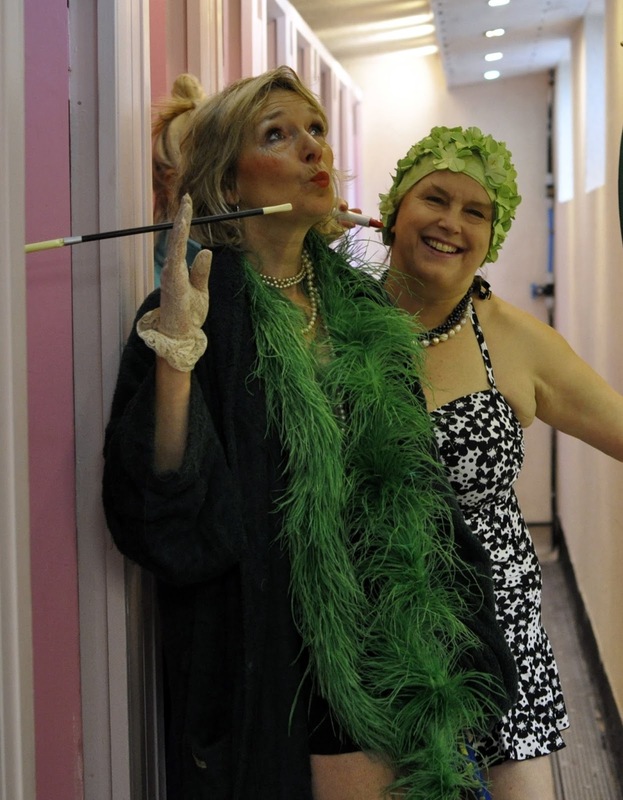 And then, to cap that, we won first prize for fancy dress. All too fabulous for words. Last Sunday I swam twice. 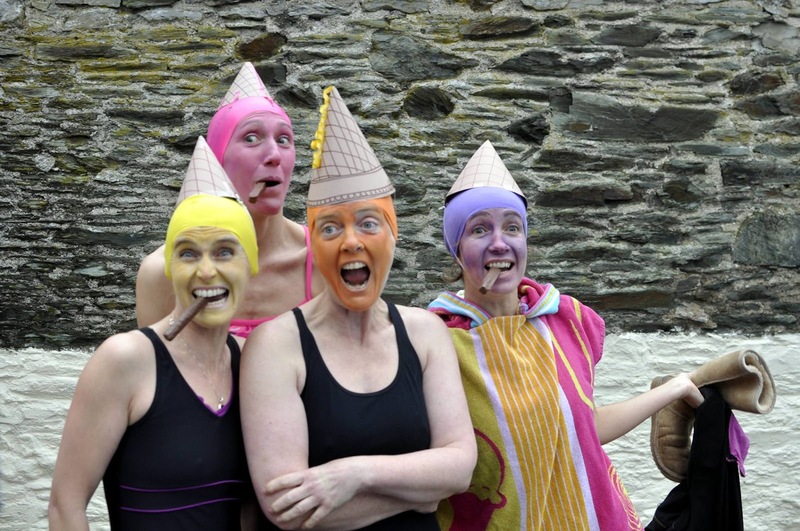 First, in our regular Sunday morning dip at Spitchwick on the River Dart where it was a very fresh 5 degrees. Then, as it was such a beautiful day I decided to go and join Carl and Kate in Brixham, for their afternoon swim at Breakwater Beach. The water was flat calm, and there was a gorgeous pinkish late afternoon light. The water was so much more forgiving than the river had been earlier. I checked my watch. 10 degrees - twice as warm as the Dart! Warm enough even for a spot of jumping and diving! I am hoping 2016 does not carry on as it's started. It's been incessantly wet and wild. Out on Dartmoor today the roads were like rivers, and the rivers were like, well torrents. We went to Spitchwick for our usual Sunday morning swim to find the Dart swollen and brown, and higher than we've ever seen it. It was flooding over the granite blocks at the edge where we normally get in, and there were white horses skipping along the surface. We got in at the edge and had great fun getting swirled around in the loop. 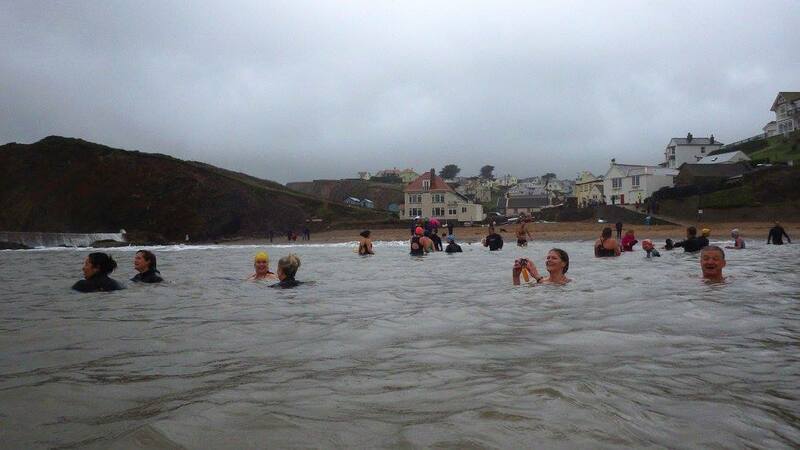 A couple of days before that we'd had our traditional New Year's Day swim at Hope Cove, where it was also wet and wild, but an extremely cheery spirit prevailed.